While it’s true Blackhole is capable of creating space-warping special effects and drones, it’s also capable of creating musical and subtle effects you’ll find useful for highlighting key instruments or painting a backdrop for your mix. 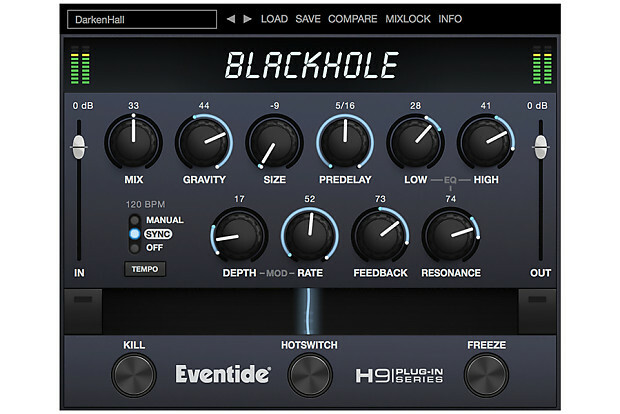 Whether you're at the event horizon or closer to home, Blackhole will inspire and amaze while its intutive controls will allow you to add that special something to your tracks without a degree in rocket science.In short, Blackhole is destined to be one of those tools that you turn to time and again when reality just isn't enough. This famed, massive reverberator first saw the light of day as an algorithm in our rackmount and remained a favorite in the rackmount . For decades studio engineers considered Blackhole their "secret weapon." More recently, it was ported to our stompbox and became the go-to ambient effect for guitar and keyboard layers. With each new version the reverb has been refined and enhanced.We’ve now perfected the galactic sounds of the Blackhole reverb in native plug-in form. With the Blackhole plug-in, any instrument in your DAW can warp acoustic space and time.